Since I was a young child, one of the things that I always heard, was that words are powerful. With it, conflicts can be avoided and if used offensively, long-term relationships can start or end, and they can even inspire us, giving us hope, dreams, direction and imagination. Through the vast alphabet that each language has, we can express our feelings, opinions and thoughts, describing us and the world around us. Based on this idea, the game Typoman was created, but is the ability to manipulate words and change effects fun? Let’s find out. 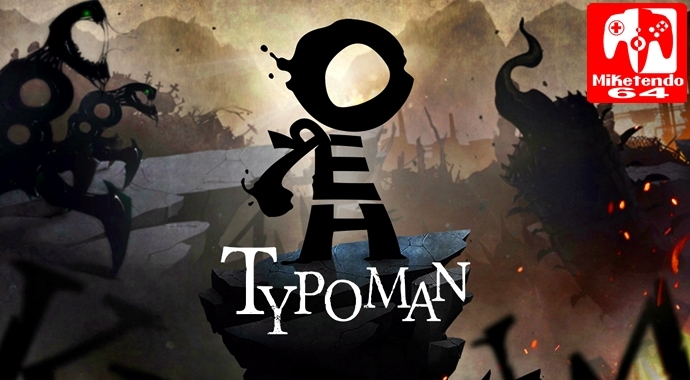 Typoman is a puzzle platformer developed by Brainseed Factory, which when it launched in 2015, was a Wii U exclusive. In the next year that followed, a new version with some improvements called Typoman: Revised was announced and released on PC and other consoles, but not released/updated on Wii U. Finally, thanks to Wales Interactive’s help, this new version finally makes its way to a Nintendo platform on the 22nd of February. When you first look at Typoman, its visuals, will most likely remind you of Limbo, which suits the game very well, since they help to create the idea of a world in need of a hero to fight the darkness. Throughout the game, a few other brighter colors will appear, normally meaning something good is happening, thus acting as a contrast that reinforces the idea of good vs evil that this game is all about. Another detail that is very interesting to notice, is that many things incorporate their name or characteristic to create their visual design, also using them in ways to trick or manipulate the player. Even the design of the hero and the enemies have this detail, which make them more interesting. I also enjoyed that in some areas you will see creatures from this world that will flee when they see you, giving a sense of a world that is alive. This game’s soundtrack isn’t as interesting as the visuals, but they aren’t terrible. They are okay for most of the time, and in a few instances, they really help to reinforce what is happening. The same can be said about the audio effects, that suits what they are intended just enough to not feel repetitive or out of place. With regards to the story premise of Typoman, it’s simple. In a world where words compose and dictate what happens, a hero is born to defeat the evil that is trying to corrupt many words and destroy the good. This hero must traverse the land solving puzzles to save himself and the world around him. This story is very basic and doesn’t twist and turn so much, with a few major events occurring from time to time, but they almost never increased my interest in the story. The quotations that you find throughout the world, will tell more about this story in text form and will use words that you’ve seen recently to tell you more about the hero and the world. Gameplay-wise, it revolves around the idea of rearranging letters to form words that will impact the world one way or the other. For example, forming the word “ON” near a platform will make it rise. That is an interesting concept that is put to good use in many puzzles, especially when they introduce the idea of using a monster created by the word “LIE” to change the word. I also liked that the revised version added the wordscrambler that easily allows you to reorganize the letters to form words. Also, the only collectable that is available in Typoman, the quotations, are, almost always, very easy to find, since the way to discover them, are normally the only detours that you can take. I only missed two quotations and after I repeated the section where I knew they would be, I found them very easily. To try and extend the game, there are 2 minigames that are unlocked as soon as you finished the main game: The Antonymizer and Word Hunter. In the former, you are given a few letters on the board and lie monsters and have to create one of the 163 words given. This mode is interesting as you have to be creative on how to get letters that aren’t available on the board. It requires you to think of opposite words from the ones available to get new letters. I think that if you really like the mechanic, this is an excellent mode, but as soon as you finish the 163 words, it will be over. One problem here that should be solved is that it is very easy to be in the middle of a solution and press the button to skip to the next word. On the other hand, Word Hunter is a mode where you are given letters on the board and you have to create as many words as you can in 60 modes. This mode can be fun when you play once or twice, but in the long term, it can get repetitive, as there isn’t a leaderboard or any reward to act as an incentive for you to play it. Finally, I think that this game deserved to be more than a straight-up port for the Nintendo Switch. If you want to read the quotations again, they are available in the journal, but the size of the letter is so small that I had difficulty reading it on the Switch’s handheld screen and even when docked. I also think that if they added in-game achievements, HD Rumble and touch controls for the word scrambler for handheld mode, then this would have made Typoman: Revised on Switch, the definitive version to play. Typoman: Revised is a good game with an interesting gameplay premise that has success in a few areas, but gets limited by the reduced length and lack of reasons to replay it. The minigames are good but aren’t good enough to extend the length of the game. If they update it with in-game achievements and hardware improvements to make it adapted for the Nintendo Switch, this version would have been much better. As it is, I could only recommend it to English speakers and that you check it out online first to decide if this kind of gameplay appeals to you and ask if you prefer portability over a version with achievements that may extend your experience with it, as that’s something only you can decide for yourself.